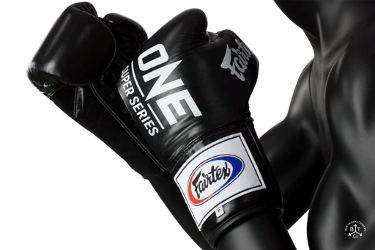 Fairtex announced becoming the official gloves partner of the ONE Super Series. ONE Championship, based in Singapore, is one of the world’s largest martial arts organization, featuring bouts across different disciplines of martial arts. By organizing events in the most iconic cities across Asia, ONE Championship has become Asia's largest sports media property, with a global broadcast reach of up to 1.7 billion potential viewers across 138 countries. In February 2018, ONE Championship announced the establishment of ONE Super Series, adding a professional kickboxing league to the portfolio. The promotion signed with impressive names, both established and upcoming talent, allowing these events to feature the world’s best strikers in Kickboxing and Muay Thai, Taekwondo, Kung Fu and several other martial arts. The first event to feature bouts in kickboxing rules took place in Manila, the Philippines titled "ONE: Heroes of Honor" in April. Fairtex announced becoming the official gloves provider of the ONE Super Series prior to the event titled: "ONE: Battle For The Heavens" held in Guangzhou, China on 7 July 2018. The Fairtex- ONE competition gloves were introduced at this event and will be used in events to follow. The Fairtex ONE competition gloves are not available for consumers at this moment. A world-class stable of talent represent the Fairtex facility from Pattaya, Thailand in the ONE Championship. Names including: Yodsanklai IWE Fairtex, Saemapetch Fairtex, Fabrice Fairtex Delannon, Yohann Fairtex Drai and Stamp Fairtex all recently signed to ONE Super Series. The next spectacle is scheduled on 6 October 2018 at Impact Arena as ONE Championship returns Bangkok, Thailand. The event, titled "ONE: Kingdom of Heroes" will headline the promotion’s first ever bout under boxing rules, a massive boxing bout between the Thai national Srisaket Sor Rungvisai (46-4-1), defending his WBC Super Flyweight World Championship for the third time against the Mexican: Iran "MagnifiKO" Diaz (14-2-3). In the co-main event, ONE Super Series Atomweight World Champion "Killer Bee" Kai Ting Chuang from China, will be challenged for her belt by the Thai female striking sensation Stamp Fairtex. The event can be viewed on One Championship's YouTube Channel.